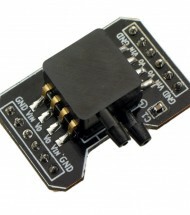 Overview BMP085 is a digital pressure sensor. Its absolute accuracy can reach 0.03hPa and power consumption is extremely low with current of only 1μA when operating in standard mode. BMP085 adopts ultra-thin 8-pin ceramic leadless chip carrier (LCC) package, which can be connected direc..
Specs:- pressure range: 21MPa; Output signal: 4 ~ 20mA; power supply (9 ~ 40) V.DC; mechanical interface:. M12X1.5 Operating temperature range: (-40 ~ 85) C °.. Specifications Model: YB-131 Series compact pressure transmitter Housing Material: All stainless steel 304 Tab Size: M20 × 1.5 (non-calibration done) Measuring range: -0.1-0-100mpa (within range options) Accuracy class: 0.5 0.2 can be customized Core: Imported diffused silicon chip Current output: 4..